Any blackjack player, having achieved a certain amount of the gambling experience, realizes the necessity of turning to a playing strategy in order to win as much as possible. Within blackjack history (majorly concerning the later stages of its development), there have already been pointed out a number of substantial moves, which will add to every player's benefit over the dealer. 1. If the player receives the count of not more, than 16, he/she should take the next card ("hit"). The exceptions are the counts of 10 - 11, which appear to be rather risky, so it's better to think over the next move more carefully, taking into consideration the dealer's open card. 2. If the player's count ranges from 17 to 20, he/she should stop taking cards from the dealer ("stand"). 3. If the total value of the player's hand is 21 - he/she will win it. 1. Having received 2 8's or 2 aces, the player should always split. 2. A player shouldn't split Face Cards, 10's or 5's. 1. If the player has a total count of 9, whereas the dealer's count isn't more, than 6, the player should double down. 2. 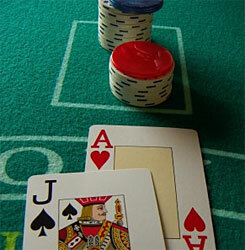 If the player has a total count of 10, whereas the dealer's count isn't more, than 9, the player should double down. 3. If the player has a total count of 11, whereas the dealer's open card is everything, but an ace, the player should double down. 1. If the player has a soft hand of 19, or 20, he/she should stand. 2. If the player has a soft hand from 13 to 18, whereas the dealer's count is between 4 and 6, the player should double down. Shuffle tracking requires the player's perfect sight, in the first place, and generally presupposes that the player traces certain cards, when the dealer is shuffling the decks, in order to find out whether they will, or won't be in a play. Card counting requires the player to use all his observation skills. The main goal of this gambling technique is to find out, what cards are still left in the set of decks in a play, and, consequently, change one's further strategy. Here, in one of the famous card-counting system it's assumed that each small card (2, 3, 4, 5, 6) has the "+1" score, all 7s, 8s, 9s have "0" score and all big-value cards (10s, jacks, queens and kings) have "-1" score, the middle-value cards being seldom taken into consideration. When the game starts, the player counts the total score of all the cards, distributed to players and the dealer. If the current score is high, there're more big-value cards, left in the decks, if not, the situation is opposite. In the latter case, the player should make further moves more carefully in order not to lose. In a whole, despite the fact that the major blackjack strategies have already been developed, every player, no matter how experienced he is, can try himself at creating a new one, which will make him reach in future.